I’m a French director, born March 5, 1969, in Paris. I have made documentaries, collaborating with Sabrina Malek, among others. I also am a location recordist. I have done my first full length documentary, « Chemins de traverse » (« Byways ») in 1996. This film is about the rail workers strikes, in the winter of 1995-96, at Austerlitz station in Paris. The film won the « prix du Patrimoine » (« Patrimony award ») at the Festival du cinéma du réel in Paris in 1997. An edited, shorter version of the film was broadcast on French/German TV channel Arte in 1997, under the name « Paroles de grève » (« Words From the Strike »). After that, I made « Une autre route » (« Another Road »), for Arte again, in 1999. This film shows several « drop-outs » we have followed. I have made « René Vautier, cinéaste franc-tireur » for France 3 TV in 2002. It’s a depiction of René Vautier, a filmmaker, author, among other films, of « Avoir vingt ans dans les Aurès ». Un monde moderne (A Modern World) was made in 2004. It has been released on screen in France in 2005. The film is about the shipyards of Saint-Nazaire (« Chantiers navals de l’Atlantique »), and addresses the topics of sub-contracting and temporary work. The film won the « Grand prix des écrans documentaires d’Arcueil » award in 2004. Most of the time, I have been cameraman/director of photography for my films – and sometimes for other film makers, too. But I’ve also been working as a location recorder. First for TV and documentaries, then for fiction films. I have worked with various directors, notably with Vietnames author Buic Thac Chuyen, on his film, « Vertiges », in 2009 (Adrift), and « Blood Curse » in 2011. « Vertiges » won the Fripesci award t the 66th Mostra in Venice, and the award for best sound at the Asia-Pacific festival in Taiwan, in 2009. It has been released in France in 201O. It features actress Linh-Dan Pham. 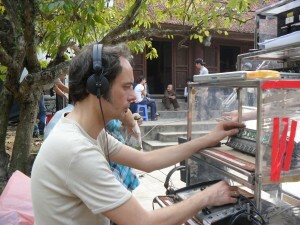 I worked with the young Vietnamese director Phan Dang Di in 2010, on his film « Bi Dung So ! » (« Don’t be afraid, Bi ! »), that won many awards throughout the world, including the SACD award and Acid/CCAS support in Cannes, on the Semaine de la critique (« Reviewer’s Week ») in 2010, and won Grand Prix du Jury at the Premiers Plans festival in Angers in 2011. The film got a national release in France in March 2012. Over the last 15 years, I’ve also worked on other films : « Redemption Song », by filmmaker and artist Markus Hansen with Jean-Marie Boulet as co-filmmaker, a portrait of American musician Billy Bang ; and Gaël Lépingle’s film about Guy Gilles : « Guy Gilles et le temps désaccordé », for which I have worked as director of photography. These last few years, I’ve been working mainly in Vietnam, a country I especially like. I currently live between Hanoi and Paris, and started to teach direct sound recording techniques to young Vietnamese sound engineers.